I have another skincare first impression for you! 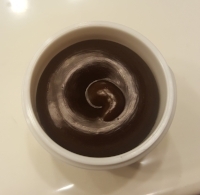 I have tried the Egg mask from skinfood and I love it. I was super excited to try this, so happy I got it in my Ipsy bag! This mask is made from molasses. They separate the sugar and the black sugar that is used is unrefined. Unlike many others, this is pure unrefined black sugar that's enriched with vitamins and minerals, organically farmed without pesticides. Sugar naturally draws moisture from the environment into the skin. Treats signs of aging by hydrating and helps your skin to retain moisture. Will leave skin feeling moisturized, soft and free of dead skin. I will be using my 2-step cleansing method. Next, while your face is still wet, take some of the mask, apply to face, and massage around for a few moments. 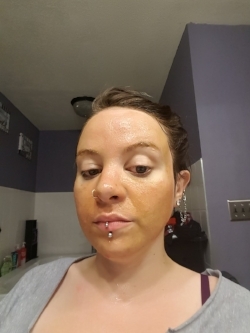 If you have ever used a mask with turmeric in it, you have seen this orange-brown face before. This mask is a little more abrasive than some of the others that I have used in the past. If you find that it's too abrasive, you can water it down a little more. I have to say, I am impressed with this. I did have some dry patches from 3 days of SFX makeup so this was a nice, refreshing way to get my skin back. I did notice my skin not only felt softer but looked brighter. Overall, I think this is a great product and I will be adding this one to my routine!